That’s Neil M. Gunn, born in 1891 in Dunbeath, writing about the river valley that runs to the sea, by the village and the harbour. His father was a fisherman, and in books like The Silver Darlings and Highland River the sea surges up, with the thunder of its waves breaking on the shore and the cries of the gulls following the herring boats. The physicist probing unexplored worlds is like the fisherman looking out at the sea. Yet we take it, and the task goes on, like the fishermen going down to the sea each morning. This is a very powerful image, of science going out to face an endless sea, of shifting changing conditions, constantly challenging, and always with the prospect of something new ahead – a situation of freedom and adventure. ‘Through freedom the adventure continues,’ he says in his last book, The Atom of Delight, a work that is both philosophical and autobiographical. That image of the quest for knowledge and understanding is also expressed by Neil Gunn as a journey upriver, travelling up the Dunbeath Water from the known lands near the harbour, up to the source of the river, to somewhere untouched by people, a place of newness and discovery. You can make the journey today, starting from the mill at the back of the village, going over a narrow footbridge and past a ruined broch tower, up to the open land at the head of the strath. 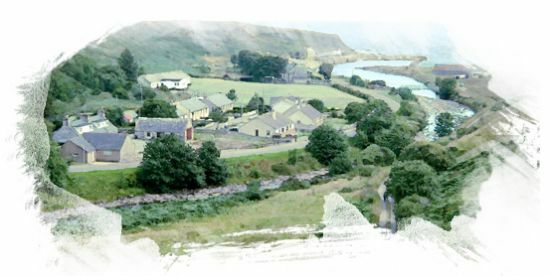 You can also find out more about Neil Gunn and the history of the area at the Dunbeath Heritage Centre, situated in the old school above the village, where you can look out over the harbour and the sea.